I don’t see this Ben-Hur remake working out. In the main story the TARDIS goes through a space-time anomaly and ends up on a beach. There the Doctor and K-9 come across the Greek god Prometheus, the one who brought life to the world, chained to a stone because the mountain had since eroded into that stone. The Doctor frees him and Prometheus uses the TARDIS to travel back to planet Olympus. Nobody is really happy to see him, especially Zeus. He wants to create a perfect, ordered universe before allowing life to flourish across the galaxy again, after breeding warlike tendencies out of the life spores that brought man to life in the first place. When the gods try to dissect the Doctor he frees Prometheus. Since gods are immortal, Prometheus gets revenge by stealing the spores to create life again. But is that Earth he’s headed for or the place the Doctor freed him from the first time? Sci-fi-ification of myth and fantasy is nothing new to Doctor Who but there are still a few goofs. For example Prometheus isn’t a god, he’s a titan. Otherwise, it’s just a basic story, and it’s not even the Doctor’s. It’s Prometheus’ story and the Doctor just shows up to open the door and taxi him around a couple of times. Star Tigers features the return of Abslom Daak. Escaping Mazam with Taiyin in hybernation, he’s seeking a way to bring her back to life. Meanwhile, Prince Salander of the Draconian Empire is trying to convince the Emperor that Mazam puts the Daleks too close to the Draconians and that they could be next. However, Salander’s political rivals convince the Emperor that the Daleks wouldn’t fight two enemies. (Because said rivals are idiots apparently.) When Salander allows Daak to land after he escapes a Dalek squad, he hopes to have Daak warn the Emperor what the Daleks really are while Daak hopes they can help Taiyin. Not only can’t they help but Salander’s rival uses dirty tricks to convince the Emperor that he’s a traitor. This was a little more exciting. While we don’t get to see Daak kill Daleks (outside of a short space dogfight we only see bits of) it sets up the next arc in Daak’s story. The political stuff isn’t as interesting, but setting up the formation of the Star Tigers is all this story really does. Overall it wasn’t that great an issue. There is a collection of the Daak strips that has Star Tigers in it if you can find it but I’m not sure this story alone really makes the comic worth it while the Doctor’s story is rather basic and really isn’t about him. Not a must have but not something to really avoid either. Posted by ShadowWing Tronix on October 31, 2018 in Television Spotlight, Yesterday's Comics and tagged Greek mythology, K-9, Prometheus, TARDIS, The Fourth Doctor. I liked how this Doctor Who tale emphasized Greek mythology. 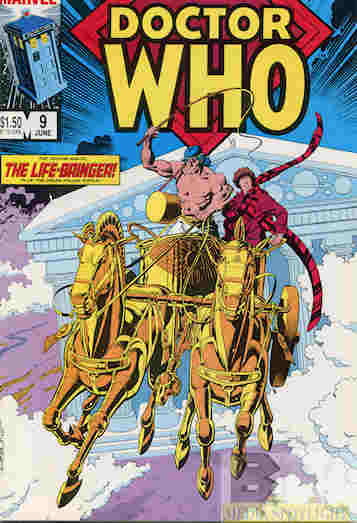 Any foray of the Doctor into Earth’s history or mythologies is always a creative plus in my view.